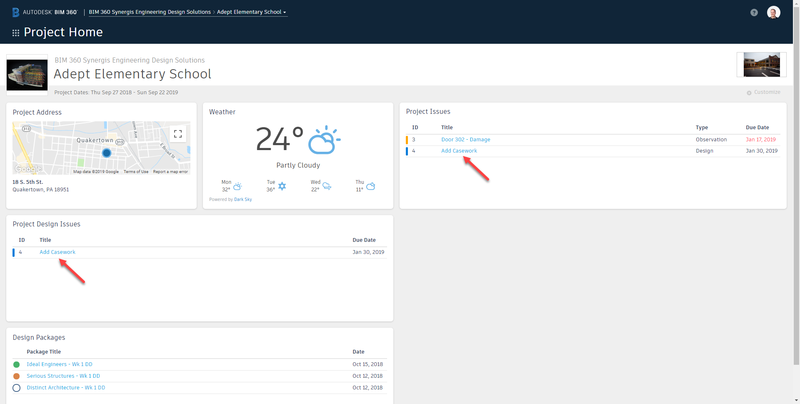 Recently, Autodesk released a new Project Admin feature called Locations. 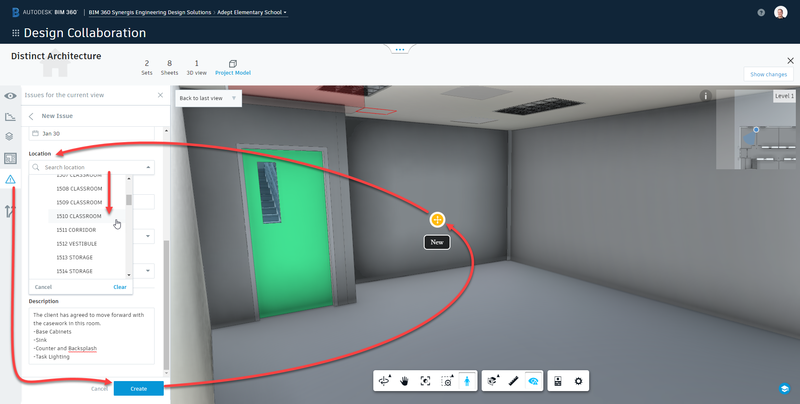 While Locations have been around for a while in classical BIM 360 Field, they are new to Next Gen BIM 360. Locations allow you to construct a hierarchy of building areas in your project. This includes structuring areas per Buildings, Levels, and Rooms. Locations can be assigned to an Issue in the Document Management and Design Collaboration services. Project Admins begin by accessing the Services tab in the Document Management service of the Project Admin module. To the left, is a list of administrative tools and active services in the project. Selecting the Document Management service unveils the Locations tool. Selecting Locations launches the workspace. Locations are set up in Tiers to create levels within the hierarchy of the project. By default, the top Tier is the Project itself. Selecting Project in the list and then, selecting Add will start the next Tier in the list. Creating the next tier of the hierarchy is accomplished in the same manner. Selecting Remove will delete the entry. Selecting Up moves the entry up in the tier one location. Selecting Down moves the entry down in the tier one location. Finally, Edit allows the entry to be modified. While this process will work, it can be time-consuming. 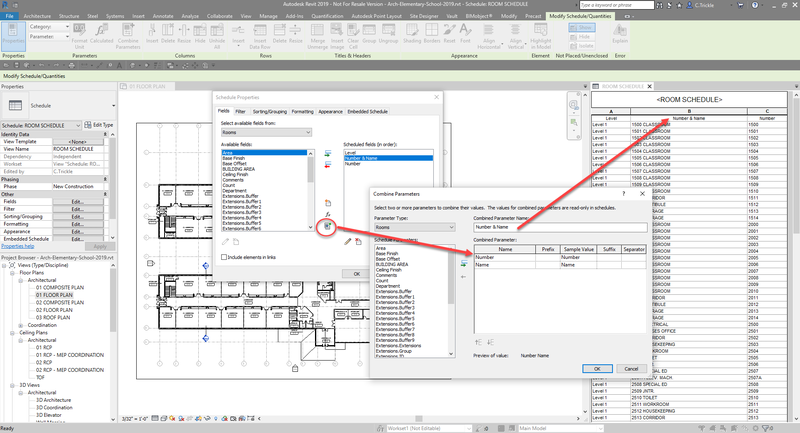 BIM tools, such as Revit, use Levels and Room Elements to define locations in the model database. This data can be easily extracted using a Schedule View of the Rooms category. The Room Schedule view can be set to field parameters such as Level, Number, and a Combined Parameter. The Combined Parameter unifies the Number and Name parameter. A space added as suffix to the Number parameter field provides the necessary separation between the Name and Number. Sorting the Rooms can be done by Level and then by Number. With the data populating the Schedule view, it is now possible to export the Room Schedule as a Report from the File tab of Revit. The default settings are ample enough for the task. Returning to BIM 360 Docs, an Excel Template can be downloaded from the Locations workspace. 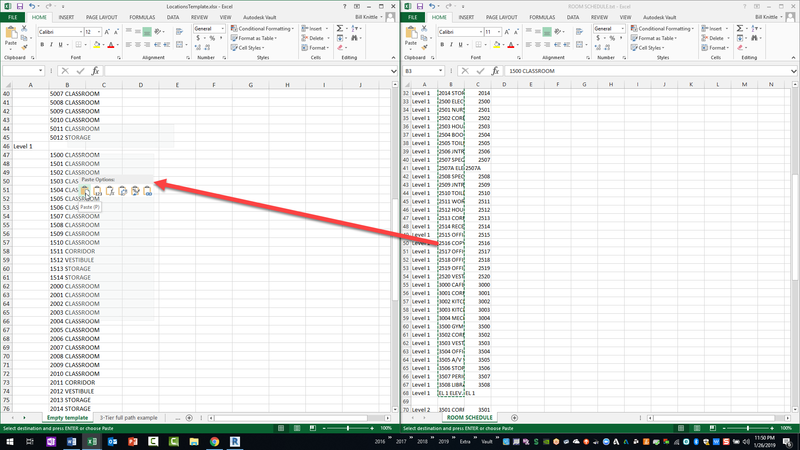 By opening the downloaded LocationsTemplate.xlsx and the ROOM SCHEDULE.txt side-by-side, the data from the Combined Parameter can be copied to the clipboard from the Room Schedule and pasted from the clipboard into the Locations Template spreadsheet. Autodesk provides examples for reference. In the examples, the hierarchy is structured from the highest floor to the lowest. Once the data is properly copied over, the Locations Template spreadsheet can be saved for import to BIM 360. This is done by selecting Import back in BIM 360, browsing to the file, and selecting it. Once the file is opened, it can be reviewed for correctness. From here, Import can be selected to begin the importing process. At which point, BIM 360 will display an alert indicating that existing content will be overwritten. Selecting Import here will finalize the process. The Locations are now imported into the project. Locations provide another layer of information to Issues. In the following example, an Issue needs to be created within the Design Collaboration module. 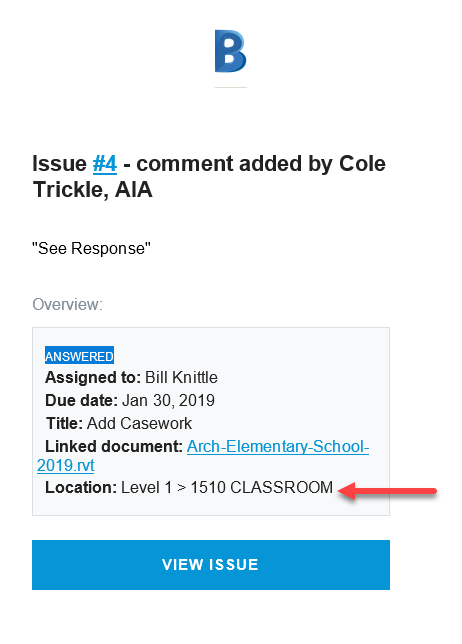 Here, the lead architect wants to notify individuals in their Revit team that a client agreed to proceed with adding casework to a given classroom. Given the view is a vantage point from within the model, there is no clear indicator of the Location other than the mini map. Therefore, the lead architect creates an Issue. As part of the process of creating an Issue, the lead architect must enter a Location. With Locations defined in the project, it is simple to select the Location from a list. As the Issue is created, an email is automatically sent to the assigned recipient or recipients. From within the body of the email, the recipient or recipients can see that the Location is clearly identified. 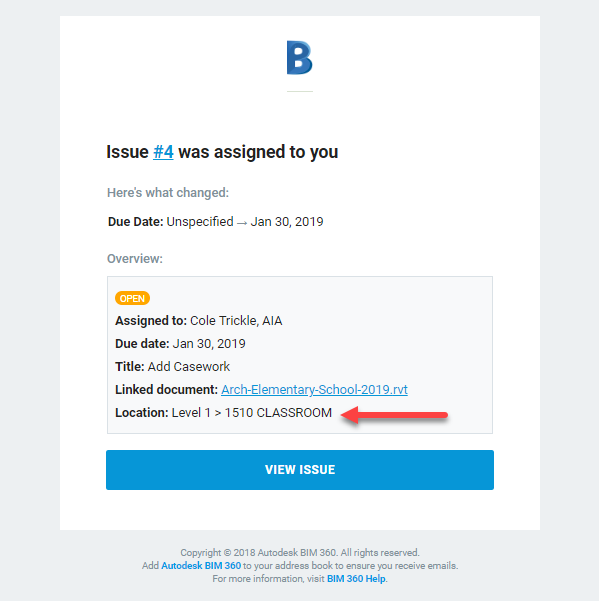 When the recipient or recipients select View Issue in the email, the web-browser launches to the sign-in page of BIM 360. Once signed in, the recipient is created by the Issue within BIM 360. Again, the Location is visible in the dialog window. Alas, the log in the Issues tab of the Document Management module also lists the Location for clarity. As the Issue is responded to, notification emails to the Issue’s creator will indicate the Location as well. Locations are not limited to Issues in the BIM 360 Docs and Design services and modules. Projects using the Field Management module (BIM 360 Build) can also implement Locations with their Checklists. In conclusion, Locations can be used to provide an additional layer of information that creates a relationship between the documents and an area of the building. Want to learn how to leverage BIM 360 in more ways? 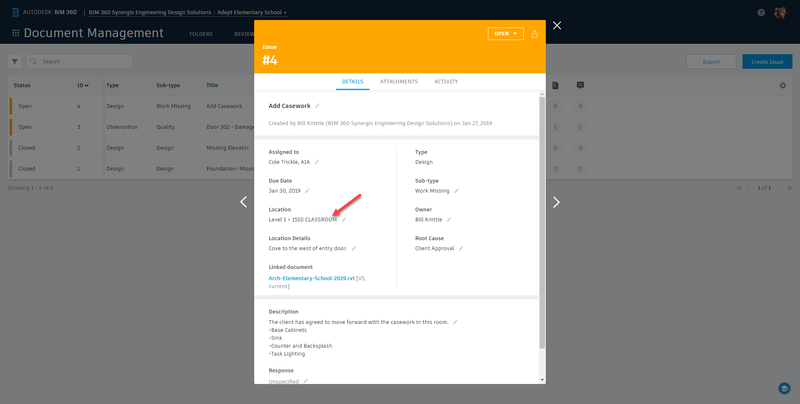 Learn about the new BIM 360 Docs Review Update in Part 8 of our Next Gen BIM 360 series. Plus, check out the Next Gen of BIM 360 YouTube playlist or contact us with your questions.